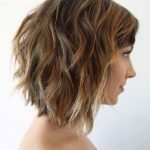 This is a great lob hairstyle for medium to thick hair with natural volume and edgy spikey tips adding lots of texture and wispy contrast around the collar-bone. The hair is styled with a little extra volume around the crown and an off-centre parting for an asymmetric touch to break the straight lines. At the front, a section of hair has been draped diagonally across the forehead to form a fringe-effect that cuts off one corner of the forehead and adds interest. This chic lob hair style is great for oval, oblong, and square faces.